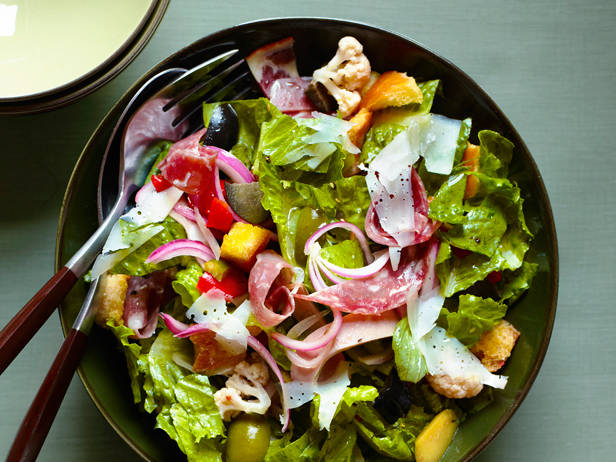 Slimmed-Down Super Bowl Side: Italian Sub Sandwich SALAD! / Hey, EEP! Slimmed-Down Super Bowl Side: Italian Sub Sandwich SALAD! Oh, hi! I've received some lovely question on Facebook about healthier Super Bowl snack ideas, so I wanted to share a fabulous salad with you: Italian Sub Salad from Food Network Magazine circa January 2012. We ran this as part of a "Light vs. Rich Super Bowl" story and I've been obsessed ever since. The salad includes all of the same great ingredients as a giant Italian sub—giardiniera, olives, mortadella, prosciutto, capicola, salami, provolone cheese—but in salad-form (think fewer calories, carbs, etc.)! Not that you should be worrying about this on Super Bowl Sunday. We're planning to make tater tot poutine, crab dip and buffalo wings. But if you can sneak something semi-virtuous into the mix, why not! Here's the recipe.